Instead of focusing on a single project this month, I wanted to do a rundown of a few projects- this time both good and bad. In what’s becoming a tradition for Downtown, yet another project there has been inexplicably downsized. Originally approved back in 2016, the project required the demolition of a historic building. This was generally considered okay because the proposed 11-story project was a significant improvement in density that would’ve added more vibrancy to this part of Downtown. 2 years later and, beyond the demolition, there had been no movement on the site, which was itself a little concerning because that typically means that something’s gone wrong or there are about to be big changes for the project. So it was no surprise when, toward the end of July, we received the bad news. Not only was the project going to be reduced in size by a full 4 stories, but all aspects of the project were getting worse. Parking spaces doubled, bike parking spaces were reduced by 70% to just 18, the ground floor retail was completely eliminated and overall residential units fell by 50 to just 70 total. Worse still, even the design of the building became just another bland box. So what happened? 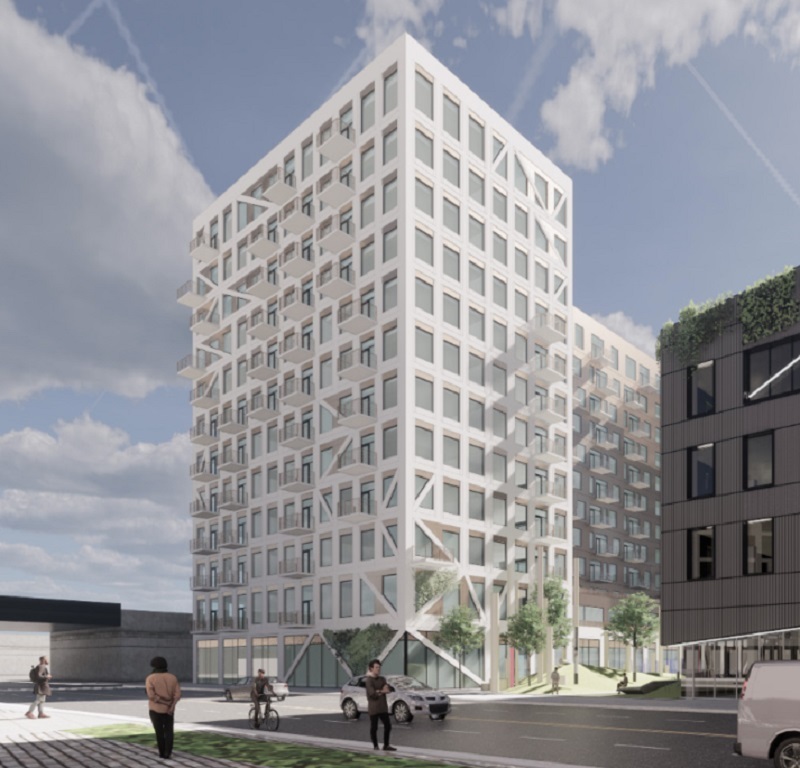 Crawford-Hoying, the developer, made some reference to rising material costs that made its plan to include affordable, micro-unit apartments too expensive, hence the reduction in project size. However, this excuse seems suspicious at best. If higher material costs were a detriment to building the affordable component, why not simply lower the number of micro units or change to a market-rate project altogether? Furthermore, what would that have to do with eliminating the retail space or increasing parking? It wouldn’t. In fact, building parking is actually very expensive, and it’s why many cities nationally are reducing or eliminating parking requirements for new projects, as it is often prohibitively expensive to build and can derail quality urban proposals. If finances were tight, the last thing a developer would do with a new project is add MORE parking rather than trying to maximize potential income with residential units or retail space. Meanwhile, in the month since the project reduction was announced, we have seen other new projects announced or previously-announced projects move forward that have seen no reduction. The company also didn’t make any changes to its 10-story Moxy Hotel project at 800 N. High street, which is currently under construction. Overall, this just feels like a bait and switch. The 11-story proposal was approved, which allowed for the demolition, and now it’s coming in smaller and of a lower quality. Regardless of the real reasons why this project was suburbanized and reduced, it continues the long-standing pattern of Downtown projects being underwhelming. Downtown should be receiving the the statement makers, so to speak. Instead, we continue to see other neighborhoods get them. Speaking of, let’s look at the good with a couple of proposals that have matched, if not exceeded, their potential. Proposed back in 2016 as a 7-story mixed-use building, the project has gone through many revisions. Over the course of the last 2 years, the project has only grown in size to its final iteration, an 11-story with more than 200 apartments, office space and retail. The $100 million project is the largest ever proposed for Upper Arlington, which has long been a more traditional suburban-style inner suburb. It has resisted the urban densification movement until recently. Being landlocked, the only way that it can increase population and maintain tax levels is to build up. Its city leadership seems to understand this, and though there was neighborhood opposition to the project, the city approved it almost unanimously. The project will replace suburban development, including a strip center and Pizza Hut, as seen below. Quality urbanism, increased walkability… this is a solid addition to Upper Arlington. Franklinton is seeing a revival these days, particularly east of 315. Multiple projects have been proposed, and the upcoming Scioto Peninsula redevelopment is on the horizon. Kaufman Development, highlighted in last month’s Missed Opportunity for having to abandon a project in Victorian Village due to NIMBYism, has been on somewhat of a roll lately. It spearheaded a significant renovation of the famed LeVeque Tower, it built both of Downtown’s largest recent projects- 250 High and 80 on the Commons (the latter of which was, of course, downsized)- and it’s heavily investing in the future of Franklinton with a stunning, out-of-the-box development named Gravity. Gravity 1.0 was proposed back in 2016 as a 6-story, mixed-use development at 500 W. Broad Street in Franklinton. Innovative in design, the project included amenities like a climbing wall, outdoor movie theater, yoga plaza, lots of public art, a dog park, biergarten and more. – A 12-story mixed-use building at the northeast corner of the site, directly to the west of the railroad tracks. – A 6-story residential building on the Stat Street. – A 5-story parking garage. – A 6-story mixed-use addition to the existing Murphy building, which will be renovated. – A 5-story townhouse building along McDowell Street. – A renovation to the existing Solazzo Building at the southwest corner. Like Gravity 1.0, the project will include different types of amenities than would be typically found. These include a green roof on the parking garage with a “city view overlook”, as well as an art walk through the lower floor of the garage. Along Broad Street, a retail plaza will be constructed out of shipping containers. Co-living will be included in the southern residential building. A food hall, brewery and restaurants are also potentially in the works. Overall, the architecture will match the funky modernism of Gravity 1.0. There is no word yet on exactly how many residential units the entire site will include, or how much retail and office space. Those details should be released in the coming months. This project is poised to become a serious game-changer for Franklinton. While there was already ongoing redevelopment in this area, a mid-rise development like this pushes the envelope and raises the prospects of future development coming in bigger, and the pace of the redevelopment will likely accelerate. This also increases the likelihood that the Scioto Peninsula to the east will see larger scale development, as well. Originally, the city wanted a couple 30+ story buildings there, with a mix of other mid-rise buildings. That plan was abandoned when an Indianapolis developer was chosen for the site and proposed mostly low-rise. That developer was let go from the project a few months ago, and the Peninsula will now be developed piece by piece. With large development occurring in Franklinton itself, the high-rises may be about to make a return, making the entire eastern section of Franklinton an extension of Downtown. So there are a few great projects that are definitely NOT missed opportunities. Take note, Downtown developers- a lot of you are getting embarrassed.